36 posts categorized "Data Brokers"
Do you use a robovac -- an autonomous WiFi-connected robotic vacuum cleaner -- in your home? Do you use the mobile app to control your robovac? "While it may seem like the information that a Roomba could gather is minimal, there’s a lot to be gleaned from the maps it’s constantly updating. It knows the floor plan of your home, the basic shape of everything on your floor, what areas require the most maintenance, and how often you require cleaning cycles, along with many other data points... If a company like Amazon, for example, wanted to improve its Echo smart speaker, the Roomba’s mapping info could certainly help out. Spatial mapping could improve audio performance by taking advantage of the room’s acoustics. Do you have a large room that’s practically empty? Targeted furniture ads might be quite effective. The laser and camera sensors would paint a nice portrait for lighting needs..."
Think about it. The maps identify whether you have one, none, or several sofas -- or other large furniture items. The maps also identify the size, square footage, of your home and the number of rooms. Got a hairy pet? If your robovac needs more frequently cleaning, that data is collected, too. "... Some of our Robots are equipped with smart technology which allows the Robots to transmit data wirelessly to the Service. For example, the Robot could collect and transmit information about the Robot’s function and use statistics, such as battery life and health, number of missions, the device identifier, and location mapping. When you register your Robot with the online App, the App will collect and maintain information about the Robot and/or App usage, feature usage, in-App transactions, technical specifications, crashes, and other information about how you use your Robot and the product App. We also collect information provided during set-up. We use this information to collect and analyze statistics and usage data, diagnose and fix technology problems, enhance device performance, and improve user experience. We may use this information to provide you personalized communications, including marketing and promotional messages... Our Robots do not transmit this information unless you register your device online and connect to WiFi, Bluetooth, or connect to the internet via another method." "When you access the Service by or through a mobile device, we may receive or collect and store a unique identification numbers associated with your device or our mobile application (including, for example, a UDID, Unique ID for Advertisers (“IDFA”), Google Ad ID, or Windows Advertising ID), mobile carrier, device type, model and manufacturer, mobile device operating system brand and model, phone number, and, depending on your mobile device settings, your geographical location data, including GPS coordinates (e.g. latitude and/or longitude) or similar information regarding the location of your mobile device..."
Use the mobile app and your robovac's unique ID number can easily be associated with other data describing you, where you live, and your lifestyle. Valuable stuff. "We may share your personal information in the instances described... i) Other companies owned by or under common ownership as iRobot, which also includes our subsidiaries or our ultimate holding company and any subsidiaries it owns. These companies will use your personal information in the same way as we can under this Policy; ii) Third party vendors, affiliates, and other service providers that perform services on our behalf, solely in order to carry out their work for us, which may include identifying and serving targeted advertisements, providing e-commerce services, content or service fulfillment, billing, web site operation, payment processing and authorization, customer service, or providing analytics services. The policy goes on to describe customers' choices with stopping or opting out of data collection programs for some data elements. If you've read that, then you know how to opt out of as much as possible of the data collection. The whole affairs highlights the fact that the data collected from different brands of smart devices in consumers' homes can be combined, massaged, and analyzed in new ways -- ways in which probably are not apparent to consumers, and which reveal more about you than often desired. And, the whole affair is a reminder to read privacy policies before purchases. Know what valuable personal data you will give away for convenience. Recently, a reader wrote via e-mail with feedback about this December 2014 blog post which discussed a lawsuit filed by the U.S. Federal Trade Commission (FTC) against a data broker, LeapLab, and other defendants. The suit alleged that the defendants sold consumers' sensitive personal information to fraudsters. The reader was unhappy because he was unable to submit a comment on that blog post. The policy of this blog is to close comments on all blog posts after a year. The reader seemed to interpret that policy as a slight against one of the defendants. No. The closing of comments after a year is equal, consistent treatment. The reader was also unhappy with comments posted by other readers to that 2014 blog post. Like other blogs, readers freely share their opinions and feedback in the comments section. Like other blogs, I am not responsible for readers' comments. Nor do I censor comments for content. I remind everyone to read the Terms of Service. The reader's e-mail feedback claimed the blog post was incomplete and one sided. Today's blog post reports the rest of the story. "A group of defendants have settled Federal Trade Commission charges that they knowingly provided scammers with hundreds of thousands of consumers’ sensitive personal information – including Social Security and bank account numbers. The proposed federal court orders prohibit John Ayers, LeapLab and Leads Company from selling or transferring sensitive personal information about consumers to third parties. The defendants will also be prohibited from misleading consumers about the terms of a loan offer or the likelihood of getting a loan. In addition, the settlements require the defendants to destroy any consumer data in their possession within 30 days. The orders include a $5.7 million monetary judgment, which is suspended based on the defendants sworn inability to pay. In addition to the settlement orders, the court entered an unsuspended $4.1 million default judgment with similar prohibitions against SiteSearch, the remaining defendant in the case." You can follow the above links to the settlement agreements between each defendant and the FTC, which were approved by the court. Links are also available on the FTC-Leaplab proceedings page. As a solo blogger with limited resources, I do my best to get it right. There's plenty of privacy news to cover, and I should have reported the above settlement agreements sooner. Hopefully, today's blog post corrects that oversight. I sincerely thank all readers for their feedback and comments. Since September, ProPublica has been encouraging Facebook users to share the categories of interest that the site has assigned to them. Users showed us everything from "Pretending to Text in Awkward Situations" to "Breastfeeding in Public." In total, we collected more than 52,000 unique attributes that Facebook has used to classify users. Facebook's site says it gets information about its users "from a few different sources." What the page doesn't say is that those sources include detailed dossiers obtained from commercial data brokers about users' offline lives. Nor does Facebook show users any of the often remarkably detailed information it gets from those brokers. "They are not being honest," said Jeffrey Chester, executive director of the Center for Digital Democracy. "Facebook is bundling a dozen different data companies to target an individual customer, and an individual should have access to that bundle as well." When asked this week about the lack of disclosure, Facebook responded that it doesn't tell users about the third-party data because its widely available and was not collected by Facebook. 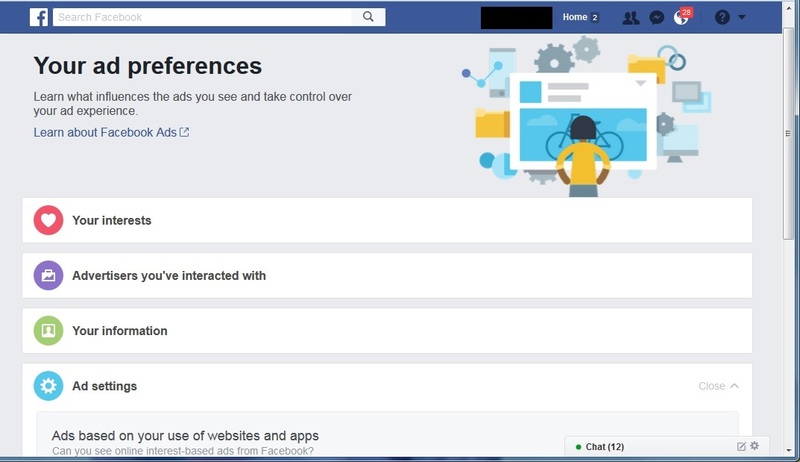 "Our approach to controls for third-party categories is somewhat different than our approach for Facebook-specific categories," said Steve Satterfield, a Facebook manager of privacy and public policy. "This is because the data providers we work with generally make their categories available across many different ad platforms, not just on Facebook." Satterfield said users who don't want that information to be available to Facebook should contact the data brokers directly. 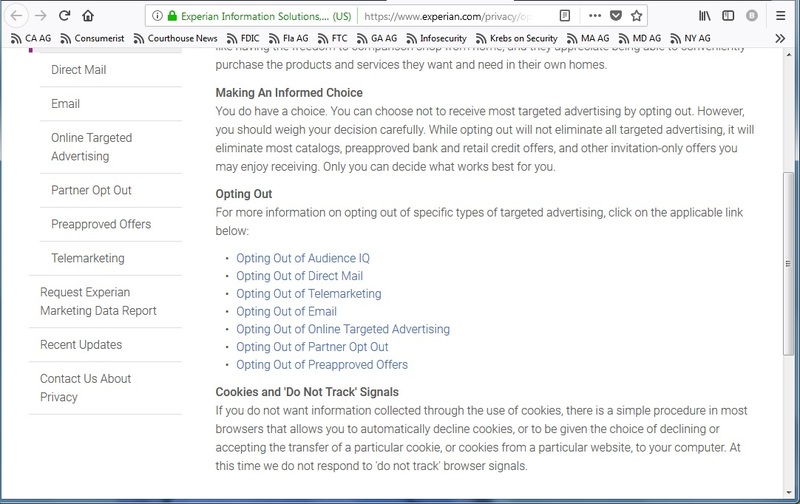 He said users can visit a page in Facebook's help center, which provides links to the opt-outs for six data brokers that sell personal data to Facebook. Limiting commercial data brokers' distribution of your personal information is no simple matter. For instance, opting out of Oracle's Datalogix, which provides about 350 types of data to Facebook according to our analysis, requires "sending a written request, along with a copy of government-issued identification" in postal mail to Oracle's chief privacy officer. One of us actually tried to do what Facebook suggests. While writing a book about privacy in 2013, reporter Julia Angwin tried to opt out from as many data brokers as she could. Of the 92 brokers she identified that accepted opt-outs, 65 of them required her to submit a form of identification such as a driver's license. In the end, she could not remove her data from the majority of providers. ProPublica's experiment to gather Facebook's ad categories from readers was part of our Black Box series, which explores the power of algorithms in our lives. Facebook uses algorithms not only to determine the news and advertisements that it displays to users, but also to categorize its users in tens of thousands of micro-targetable groups. Our crowd-sourced data showed us that Facebook's categories range from innocuous groupings of people who like southern food to sensitive categories such as "Ethnic Affinity" which categorizes people based on their affinity for African-Americans, Hispanics and other ethnic groups. 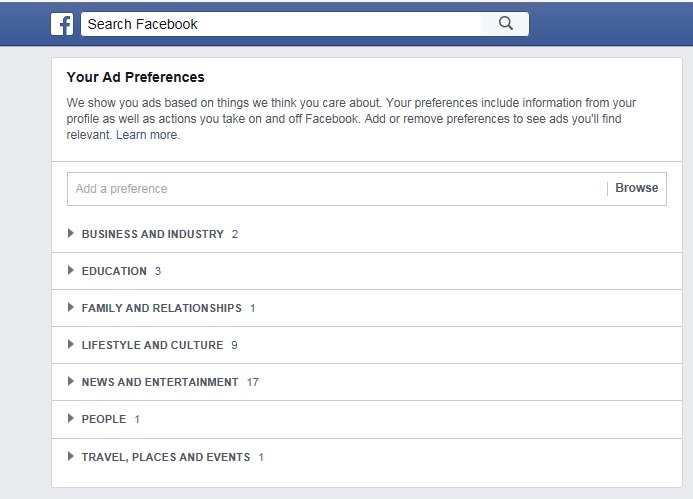 Advertisers can target ads toward a group 2014 or exclude ads from being shown to a particular group. Facebook has been working with data brokers since 2012 when it signed a deal with Datalogix. This prompted Chester, the privacy advocate at the Center for Digital Democracy, to filed a complaint with the Federal Trade Commission alleging that Facebook had violated a consent decree with the agency on privacy issues. The FTC has never publicly responded to that complaint and Facebook subsequently signed deals with five other data brokers. The categories from commercial data brokers were largely financial, such as "total liquid investible assets $1-$24,999," "People in households that have an estimated household income of between $100K and $125K, or even "Individuals that are frequent transactor at lower cost department or dollar stores." We compared the data broker categories with the crowd-sourced list of what Facebook tells users about themselves. We found none of the data broker information on any of the tens of the thousands of "interests" that Facebook showed users. Our tool also allowed users to react to the categories they were placed in as being "wrong," "creepy" or "spot on." The category that received the most votes for "wrong" was "Farmville slots." The category that got the most votes for "creepy" was "Away from family." And the category that was rated most "spot on" was "NPR." "It was a CouchDB database that required no authentication to be accessed, hosted on Google’s Cloud services. Luckily, an ID associated with each record pointed [the security researcher] in the right direction regarding the owner of the data... the data was originally collected by a data brokerage company named L2... The client told us that they were hacked, the firewall was taken down and then the probing began..."
"Some of the records also contained information about the voters’ marital status, whether they had children or owned a gun, their stance on gay marriage, the language(s) they speak, and their email address." This is the type of information a political party would collect. The report did not state which political organization. The security researcher also discovered that the unprotected online database was accessed by others, including a user in Europe. The database is no longer online. The report did not state who would notify affected persons, or when this might happen. "I don't know George, this sort of creeps me out." It should creep you out. Do you want technology between you and your spouse? During very private, intimate, face-to-face conversations? I think not. Wearables, fitness trackers and smart homes outfitted with certain Internet-of-things devices will perform this mood data capture. Whenever somebody uses technology to offer convenience, watch out. There is usually are accompanying data capture, tracking, and privacy issues (e.g., notice, consent) embedded. Will companies adequately protect emotional information from data breaches? How will your government and law enforcement acquire, archive, and use moods information? "One company is tracking voter characteristics through some likely sources — their phones. Dstillery is a big data intelligence company that sells targeted advertising information about consumers to big companies like Microsoft and Comcast. But in the Iowa primary, the company tried its hand at compiling voter traits... people who loved to grill or work on their lawns overwhelmingly voted for Trump in Iowa... people who watched and supported NASCAR also happened to support Donald Trump and Hillary Clinton..."
Dstillery's has an impressive list of clients: AT&T, Cablevision, Comcast, DirecTV, Hulu, Sprint, T-Mobile, Verizon, Vonage, and many more. If you remember your college statistics classes, then you know that a correlation does not man causation. Things may happen together but it doesn't mean one causes the other. Being a NASCAR fan doesn't mean a voter will vote for certain candidates. Voting for certain candidates does not mean you will be a NASCAR fan. This "big data" collection is also a reminder of how much we consumers share on social networking sites. All a consumer has to do is "Like" a brand (e.g., NASCAR, one of these top-10 barbeque grills, a particular politician, etc.) on Facebook.com, or "Follow" that brand (or politician) on Twitter and it is pretty easy for a big data intelligence company to collect, analyze, and compare voters preferences. 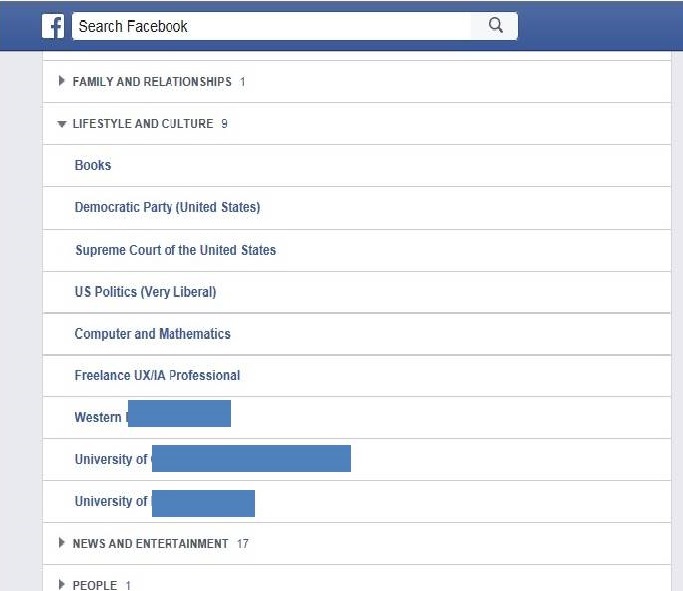 (Facebook knows far more about you than you realize.) Even if you didn't "Like" or "Follow" a brand, the data collection is still pretty easy. All a big data intelligence firm has to do is troll through the metadata attached to photos you took with your phone and posted online: racetracks on Instagram, NASCAR cakes on Pinterest, or whatever else. You get the idea. The metadata attached to your photos recorded where and when you were (e.g., geo-location of the racetrack), the background scene (e.g., stands, pits, etc. ), and the people (e.g., emblems on their clothes). This blog post explains what happens when you stop "Liking" posts and comments on Facebook. The data analysis is also pretty easy because many most of you gave your mobile phone numbers to social networking sites so you could use their mobile apps. Both social networking sites and data brokers have two crucial data elements (e.g., your birth date, your phone number) to match, merge, and purge data about you. So, political campaigns (via data brokers and big data intelligence firms they hire) can understand pretty easily who actually voted, and for whom, at a particular voting location. Is this a good thing? I guess your answer to that depends upon how much privacy you want associated with your voting activity. What you do within the voting booth may be private, but there are many players performing surveillance outside the booth to reveal what you did in the booth. And, if you aren't careful what you say in front of Internet-of-Things devices installed in your home (e.g., toys, smart televisions, smart speakers or search robots, etc. ), then the data collection is probably even more extensive. "... data for politics is not a new phenomenon. Presidential candidates began pioneering the approach more than a decade ago, and it was a key part of Barack Obama’s winning strategy in 2008 and 2012. But technological advancements, plunging storage costs and a proliferation of data firms have substantially increased the ability of campaigns to inhale troves of strikingly personal information about voters... as presidential campaigns push into a new frontier of voter targeting, scouring social media accounts, online browsing habits and retail purchasing records of millions of Americans, they have brought a privacy imposition unprecedented in politics. By some estimates, political candidates are collecting more personal information on Americans than even the most aggressive retailers... The campaigns and the data companies are cagey about what particular personal voter details they are trafficking in..."
Reportedly, one firm collected 500 data elements about each voter. That means, they know a lot about you. You can click on each item to see details about that item. You can also mouseover an item to display a button to toggle on or off each item. That tells Facebook to either display or suppress targeted advertisements to you about that item. (I turned 95 percent of mine off.) If you "Like" the Facebook page for a specific brand, product, service, newspaper, organization, event, or person then the site is happy to catalog that and serve targeted ads from that entity, or other companies in that category. This provides a huge clue as to the data elements Facebook has collected and shared with data brokers and its partners. Chances are, some of this information has already made its way via data brokers into the databases of political campaigns. You can read in this blog about data brokers and tech companies that have assisted social networking sites. "The data companies are required by law to keep the names of individuals separate from the pile of data accumulated about them. Instead, each voter is assigned an online identification number, and when a campaign wants to target a particular group – say, drivers of hybrid vehicles or gun owners – the computers coordinate a robocall, or a volunteer’s canvassing list, or a digital advertisement with relevant accounts. Since campaigns are ultimately in the business of finding particular people and getting them to show up to vote, some scholars are dubious their digital targeting efforts offer the same level of anonymity as those of corporations." So, campaigns will re-assign names to information the data brokers have supposedly anonymized. Are you happy with that? Are you happy with political campaigns knowing this much about you? Are you confident that political campaigns adequately protect your personal information? Do you believe that you should have some say in what political campaigns collect and archive about you? Do you want control over your personal information? "There is a tremendous amount of data out there and the question is what types of controls are in place and how secure is it,” said Craig Spiezle, executive director of the nonprofit Online Trust Alliance. The group’s recent audit of campaign websites for privacy, security and consumer protection gave three-quarters of the candidates failing grades... An exhaustive paper [New York University School of Law researcher] Rubenstein recently published on voter privacy found that “political dossiers may be the largest unregulated assemblage of personal data in contemporary American life.” Basic privacy guidelines that apply to other industries don’t appear to apply to candidates. Some do not even have clear privacy policies posted on their websites..."
Now you have an idea of what data is out there about you. 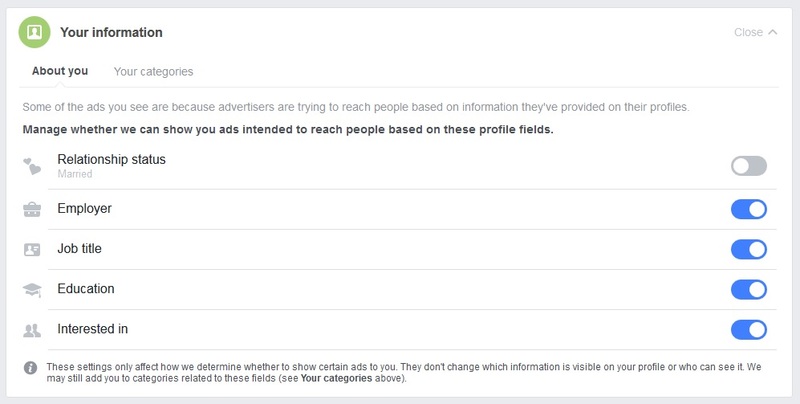 If you want to turn off targeted ads displayed by Facebook, you can. You can't stop the data collection though. The data collection, archiving, and resale is part of most social networking sites' business models. Are political campaigns reselling data to make money? Are you interested in what political campaigns have collected about you? Do you think it's accurate? "In response to challenges of the data’s authenticity, Impact Team began a second series of dumps, including what appears to be essentially all corporate records, including source code, internal business documents and corporate emails of Avid Life Media/Ashley Madison... Within those hundreds of thousands of documents is one entitled Areas of Concern – Customer Data (abbreviated in this article, AoC)... The needle in the treasure trove haystack of corporate data... In the AoC, the IT business practices of Avid/Ashley Madison began to emerge, including its relationships with third party vendors. New Relic is mentioned as one of three third party IT vendors to Avid. Also mentioned in that document as vendors are OnX (publicly reported as being an Ashley Madison vendor) and Redis/Memcached (alternative open source caching tools)... The AoC identifies New Relic as being a customer data “concern” (worry), by mentioning that it could employ “a hacker/bad actor” who could gain access to customer data. There was nothing in the AoC to indicate any reason to call out New Relic as a third party vendor presenting particular customer data security risks." "The existence of third party IT vendors may be of interest to the increasing numbers of plaintiffs suing Avid and Ashley Madison. These plaintiffs have, to date, apparently not named these vendors as defendants." "... the Missouri suit states that its anonymous plaintiff paid a $19 fee to have Ashley Madison delete her personal information from its servers but failed to deliver on that service." "James Young, a patient whose medical information was compromised, filed the paperwork Wednesday in U.S. District Court in Fort Wayne. The Indianapolis man is seeking to create a class action, which would allow others who had personal information stolen in the data breach to join the lawsuit... Young alleges that MIE failed "to take adequate and reasonable measures to ensure its data systems were protected," failed to stop the breach and failed to notify customers ina timely manner." "A lot more people than you realize, including your employer, your bank, state and federal agencies, insurance companies, drug companies, marketers, medical transcribers and the public, if your health records are subpoenaed as part of a court case. All those entities can access your records without getting special permission from you, according to Patient Privacy Rights." Austin, Texas-based Patient Privacy Rights is an education, privacy, and advocacy organization dedicated to helping consumers regain control over their personal health information. The Journal Gazette news article was the first report I've read disclosing the total number of breach victims. Reportedly, MIE sent 3.1 million breach notices to affected consumers nationwide. Help Net Security reported a total of nearly 5.5 million consumers in the U.S. affected. That includes 1.5 million consumers affected in Indiana, and 3.9 million consumers in other states. Compromised or stolen data goes as far back as 1997. Reportedly, the Indiana Attorney General's office has begun an investigation. "An unethical provider could bill an insurance company or the federal government for health care that it never gave you. Any amount not covered would then be billed directly to you, which could affect your credit score... Then there’s the issue of using sensitive medical information for marketing – or even for blackmail. Let’s say someone was treated for AIDS, hepatitis C or a sexually transmitted disease. A company selling prescription drugs or other products might like to target that patient for advertising. But sending brochures or coupons in the mail could tip off others about the condition. Someone with those or similar medical conditions could face discrimination in hiring..."
"The suit alleges that Experian negligently violated consumer protection laws when it failed to detect for nearly 10 months that a customer of its data broker subsidiary was a scammer who ran a criminal service that resold consumer data to identity thieves... The lawsuit comes just days after a judge in New Hampshire handed down a 13-year jail sentence against Hieu Minh Ngo, a 25-year-old Vietnamese man who ran an ID theft service variously named Superget.info and findget.me. Ngo admitted hacking into or otherwise illegally gaining access to databases belonging to some of the world’s largest data brokers, including a Court Ventures— a company that Experian acquired in 2012. He got access to some 200 million consumer records by posing as a private investigator based in the United States... The class action lawsuit, filed July 17, 2015 in the U.S. District Court for the Central District of California, seeks statutory damages for Experian’s alleged violations of, among other statutes, the Fair Credit Reporting Act (FCRA)..."
I included information about both class-actions in a single blog post since both companies are of interest to consumers affected by MIE's data breach. MIE has offered breach victims two years of free credit monitoring services from Experian. Do you know how much your bank account information is worth to fraudsters? Read on. "... LeapLab bought payday loan applications of financially strapped consumers, and then sold that information to marketers whom it knew had no legitimate need for it. At least one of those marketers, Ideal Financial Solutions – a defendant in another FTC case – allegedly used the information to withdraw millions of dollars from consumers’ accounts without their authorization." Defendants named in the lawsuit include Sitesearch Corporation (doing business as LeapLab), LeapLab, LLC (based in Arizona), Leads Company (based in Nevada), and John Ayers. LeapLab's Twitter account seems dormant, and its website is not operating. 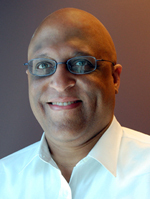 BusinessWeek lists John Ayers as Chairman of the Board of LeapLab. "... collected hundreds of thousands of payday loan applications from payday loan websites known as publishers. Publishers typically offer to help consumers obtain payday loans. To do so, they ask for consumers’ sensitive financial information to evaluate their loan applications and transfer funds to their bank accounts if the loan is approved... The defendants sold approximately five percent of these loan applications to online lenders, who paid them between $10 and $150 per lead... the defendants sold the remaining 95 percent for approximately $0.50 each to third parties who were not online lenders and had no legitimate need for this financial information." "... marketers that made unsolicited sales offers to consumers via email, text message, or telephone call; data brokers that aggregated and then resold consumer information; and phony internet merchants like Ideal Financial Solutions. According to the FTC’s complaint, the defendants had reason to believe these marketers had no legitimate need for the sensitive information they were selling..."
"... to make millions of dollars in unauthorized debits and charges for purported financial products that the consumers never purchased. LeapLab provided account information for at least 16 percent these victims." "The complaints are part of a multiyear government crackdown on fraudulent debt collection and other scams that target people in financial distress. But the case against LeapLab indicates that federal regulators are now widening their investigation to include the middlemen who traffic in the kind of closely held consumer details that can make consumers vulnerable to financial scams... Frederick G. Gamble, a lawyer in Tempe, Ariz., who was listed as a statutory agent of LeapLab, did not respond a voice mail message seeking comment..."
Thanks to the FTC staff for enforcing credit laws. I look forward to the FTC pursuing more data brokers and non-lender third parties who engage in similar behaviors. Thee has to be strong consequences for this type of wrongdoing. I hope that the defendants pay fines, pay the credit monitoring and resolution costs for affected consumers, and serve time in prison. That sounds about right for the amount of damages inflicted upon consumers. I apologize to readers. I am almost caught up with blog posts after the DDoS attack last week against Typepad, the blogging service I use. "On March 3, Hieu Ngo, a Vietnamese national, pleaded guilty to federal charges in New Hampshire federal court involving his operation of a website that offered his clients access to sensitive personal information for more than 200 million U.S. citizens, including social security numbers, which could be used to commit identity theft or financial fraud... Ngo gained access to the personal information when he obtained an account with a U.S. company known as Court Ventures by posing as a private investigator from Singapore. Due to a reciprocal data sharing agreement between Court Ventures and U.S. Info Search, LLC of Columbus, Ohio, Ngo’s account allowed him access to a database that allegedly contained names, addresses, dates of births, and social security numbers of more than 200 million U.S. citizens." "For at least an 18-month period, more than 3.1 million queries were made to the database using Ngo’s account. According to Experian, it purchased Court Ventures’ assets in March 2012, and continued to honor Ngo as a customer until December 2012." Order copies of your credit reports from the three major credit-reporting agencies (e.g., Experian, Equifax, and TransUnion) and review them for fraudulent entries. If you notice fraudulent entries on your credit reports, place a Fraud Alert on them. Review your credit card and debit card statements for fraudulent entries. Contact the fraud departments at your bank or card issuer to report fraudulent charges. File a police report with local police if you are a victim of fraud. Consider placing a Security Freeze on your credit reports for stronger protection. Consumers that don't have a credit monitoring service can visit AnnualCreditReport.com to order their free credit report once each year from the three major credit reporting agencies (e.g., Equifax, Experian, and TransUnion). Consumers that experience fraud can also submit complaints to the Federal Trade Commission, which tracks fraud affecting consumers. Consumers who experience problems (e.g., poor customer service, failure to fix fraudulent charges you reported, etc.) with a credit reporting agency, can submit complaints to the Consumer Financial Protection Bureau, (CFPB). At the CFPB site, click on "the Submit A Complaint" link. The CFPB began overseeing credit reporting agencies in 2012. Expect to hear more news about this breach investigation. "Under the DATA Act, consumers would be able to access their personal information, make corrections, and opt out of marketing schemes. The DATA Act would empower the FTC to impose civil penalties on violators, and would prohibit data brokers from collecting consumer data in deceptive ways." A variety of companies collect, and sell, information about consumers. During the past 6+ years, this blog has reported about some data brokers, including ChoicePoint, Acxiom, Intelius, US Search, Spokeo, and Lexis-Nexis. Several data brokers have experienced data breaches, and some have sold consumers' sensitive personal data to organized crime. Data brokers collect a wide variety of information about consumers including but not limited to: current and past residential addresses, landline and mobile phone numbers, financial records, products and services purchased, autos purchased, retailers you shop at, and a lot more. With the growth of smart phones, mobile devices, and wearable devices, this data collection is growing quickly to also incude consumers' geo-location information and movement in the real world, health information, and exercise/workout information. With the rise of data mining (a/k/a "big data"), companies seek to collect as much information as possible about their customers as possible. By analyzing this data, companies can deduce your favorite colors, tastes, and related preferences; including whether you are right- or left-handed. Your personal information is bought, sold, and traded between banks, data brokers, retail stores where you shop, telemarketing firms, collections agencies, and your local government. "The Data Broker Accountability and Transparency Act of 2014 (DATA Act) comes on the heels of an investigation and majority staff report by the Commerce Committee into the multibillion-dollar industry. Released in December 2013, the report revealed the breadth and scope of the sensitive data – including financial, health, and other personal information – that is routinely amassed by data brokers on consumers without their knowledge or consent. The Committee also held a hearing on Dec. 18, 2013, to examine the privacy and accountability concerns with the industry." "Though similar bills have died on the Senate floor previously, the Direct Marketing Association says it intends to fight the DATA Act's progress “tooth and nail” due to the high profile it receives from Rockefeller... The section of the DATA Act that most offends marketing stakeholders would compel data brokers to grant consumers access to their data with the ability to correct it at least once a year at no cost. The cost would fall on the so-called data brokers." You would think that an industry that wants to sell accurate information would welcome corrections by consumers, who know their personal information best. It seems that accuracy takes a back seat to profitability. And, the companies making profits with the information they sell are in the best position to absorb the costs of corrections. If they can't do so profitably, then get out of the business. Read the full text of the proposed DATA Act (Adobe PDF). Contact your elected officials and tell them to support the DATA Act. In the interest of full disclosure, I worked for Lexis-Nexis in its Dayton, Ohio headquarters from 1984 to 1986.